Edgar Dean Mitchell, Sc.D. (born September 17, 1930 in Hereford, Texas) is an American pilot, retired Captain in the United States Navy and NASA astronaut. 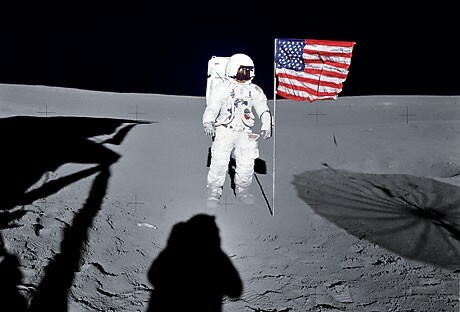 As the lunar module pilot of Apollo 14, he spent nine hours working on the lunar surface in the Fra Mauro Highlands region, making him the sixth person to walk on the Moon. As a youth, Mitchell was active in the Boy Scouts of America, where he achieved its second highest rank, Life Scout. He was also a member of DeMolay International and has been inducted into its Hall of Fame. Mitchell earned a Bachelor of Science degree in industrial management from Carnegie Institute of Technology in 1952. The following year he joined the U.S. Navy, where he trained as a pilot and flew off the aircraft carriers USS Bon Homme Richard and USS Ticonderoga. He later qualified as a research pilot and taught at the Navy's research pilot school. While on active duty in the Navy, he earned a Master of Science degree in aeronautical engineering from the U.S. Naval Postgraduate School and a Doctor of Science degree in aeronautics and astronautics from the Massachusetts Institute of Technology. Mitchell was selected to be an astronaut in 1966 and was seconded from the Navy to NASA. He was designated as backup lunar module pilot for Apollo 10, and flew as lunar module pilot on Apollo 14, where he spent nine hours working on the lunar surface in the Fra Mauro Highlands region, making him the sixth person to walk on the Moon. He was presented with the Presidential Medal of Freedom in 1970 by President Richard Nixon. 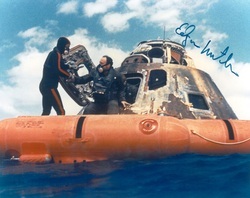 Photograph in collection is an autographed photo of Mitchell being assisted out of the Apollo 14 spacecraft after splashdown.